SMYTH, GEORGE STRACEY, army officer and colonial administrator; b. 4 April 1767, likely in Norwich, England, youngest son of the Reverend John Smyth and Sarah Gee, a cousin of the future 1st Marquess Camden; he and his wife, Amelia Anne, had two children, a daughter and a son; d. 27 March 1823 in Fredericton. On 20 May 1779, at the age of 12, George Stracey Smyth was appointed an ensign in the East Norfolk Regiment of Militia. After joining the army the following year as an ensign in the 25th Foot, he rose through the ranks to become a major general on 1 Jan. 1812. 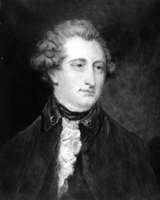 In May 1791 he was a lieutenant and serving in Gibraltar as adjutant of the 7th Foot, under the command of Prince Edward* Augustus, the fourth son of George III. He shared with the prince an enthusiasm for music and made himself useful by accompanying Edward and Mme de Saint-Laurent [Montgenet] on the piano when they sang duets for the entertainment of the household. He served on the prince’s staff for 12 years, in Gibraltar, Quebec, the West Indies, Nova Scotia, and Gibraltar a second time. “No Musick! The People No Souls in this Province,” he lamented shortly after his arrival in Halifax, where he was fort major in the years 1794–99. He was promoted to the rank of major in September 1798. When Edward, now Duke of Kent, became commander-in-chief of the forces in British North America in 1799, he made Smyth his senior aide-de-camp and acting quartermaster general. He also named Smyth’s elder brother, the Reverend John Gee Smyth, as his domestic chaplain. Four years later, on the duke’s retirement to England, George Stracey Smyth was one of the grooms of his household. Subsequently, he served on the staff of the Duke of Cambridge, the youngest son of George III, who was in command of the Home District. 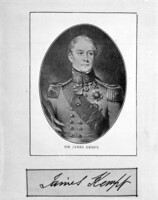 The association with royalty, backed up by the patronage of his politically powerful cousin Lord Camden, made it easy for Smyth to rise in his profession and accounts for his appointment as commander of the forces in New Brunswick soon after his promotion to major-general made him eligible for such a position. Under regulations instituted in 1808, the commander of the forces was responsible for the civil administration of the province, the lieutenant governor, Thomas Carleton*, being on permanent leave in England. Smyth served as president of the Council from 15 June 1812 to August 1813, when he fell ill, and from 2 July 1814 to June 1816, when he was called to Nova Scotia to administer that province and act as commander-in-chief until the arrival of Lord Dalhousie [Ramsay*] in October. He succeeded Carleton as lieutenant governor of New Brunswick in February 1817; after a brief visit to the province in June, he returned in July and remained there until his death. In 1812 he took over his duties from Lieutenant-General Martin Hunter* shortly before word arrived of the American declaration of war. On receiving the news he met at once with his council to decide what action should be taken. Instructions were given that one-third of the militia should be ready for service at short notice but, since it was the planting season, it was decided that men would not immediately be called away from their farms. Smyth ordered the battalion commanders to retreat at first if there should be an invasion but to increase resistance when reinforcements were assembled. At Saint John, which was bound to be the objective of any serious attack, there was an enthusiastic response from the Common Council and the populace, who erected breastworks and batteries and prepared boats for the movement of troops. After the declaration of war Americans on the border gave assurances of their peaceful intentions, and the Indians also expressed their desire for friendship. The pacifism of the New Englanders fitted in nicely with the policy of the British, who encouraged American shipowners and merchants to defy their government’s efforts to prevent them engaging in international trade. Since 1807, when the embargo was imposed, illicit trade had flourished in Maritime ports, with the Americans selling food and supplies in exchange for British manufactures and for gypsum. American ships, under licence from the British authorities, brought their cargoes openly into Saint John Harbour, while an extensive trade was carried on, somewhat less overtly, amid the islands and coastal waterways of Passamaquoddy Bay. On 10 July Smyth, following the example of Lieutenant Governor Sir John Coape Sherbrooke in Nova Scotia, issued a proclamation forbidding British subjects to molest the inhabitants of the United States living on the shores near New Brunswick, or to interfere with their coasting or fishing vessels, so long as they abstained from molesting the inhabitants of Nova Scotia and New Brunswick. Meanwhile, enterprising citizens of Saint John, remembering the profits that had been made from raiding enemy shipping in earlier wars, were being tempted by the opportunity for privateering. Supported by members of his council, who quoted precedents from the 1790s, Smyth naïvely responded to requests by issuing letters of marque and reprisal, the first, on July 27, to a Saint John privateer, renamed the General Smyth, authorizing it to seize American vessels as prizes of war. The activities of the privateers disrupted the licensed trade and he received a severe reprimand from Lord Bathurst, the secretary of state for War and the Colonies. A second initiative undertaken by Smyth was the purchase of a 70-ton sloop, the Brunswicker, on behalf of the colonial government. He fitted it up for the protection of the coastal trade, but Bathurst ordered him to rely on the navy and refused to pay the costs involved. Apart from the threat to shipping in the Bay of Fundy, the situation remained quiet. Work proceeded on the building of a Martello tower and other coastal defences but the threat of invasion was so remote in January 1813 that Lieutenant-General Sir George Prevost*, the commander-in-chief in British North America, ordered the 104th Foot, the only significant body of regular soldiers in the province, to march to Upper Canada to reinforce the army there. There was a second exciting march on snowshoes that winter: some 200 Acadian militiamen from the Baie des Chaleurs appeared in Fredericton, having, in the words of Lieutenant-Colonel Joseph Gubbins, the inspecting field officer of militia, “without the aid of government passed through a wilderness of nearly 300 miles” to prove their readiness to assist in the defence of the frontier. Smyth left the province on sick leave in 1813, having been stricken with “repeated attacks of pulmonice threatening Phthisis Pulmonia or Consumption.” Though he had returned to duty by July 1814, he was not involved in the British occupation of the Maine towns of Eastport, on Moose Island in Passamaquoddy Bay, and Castine that year. However, Moose Island, which lies on the New Brunswick side of the channel the British then claimed as the boundary under the treaty of 1783, was placed under Smyth’s command. 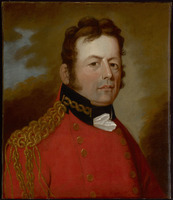 In May 1815 Sherbrooke, as commander-in-chief in the region, stated in a letter that he had always considered Saint John to be the best military headquarters of the New Brunswick district and gave his approval to Smyth’s residing there. 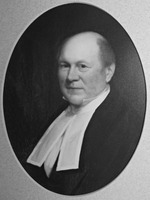 Smyth preferred Saint John to Fredericton, the civil capital, which, however, was the only place where a quorum of Council could meet conveniently. 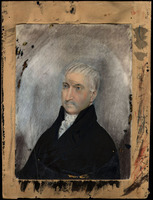 He therefore wrote to Sherbrooke asking whether he should consider his letter a command, “as in that case it will be necessary for me to apply to the secy of state for a sufficient number of councillors to be appointed, who may be residents of St. John.” Two years later Bathurst authorized the appointment of two wealthy merchants, William Pagan* and William Black*, thus providing Smyth with a counterweight to the dominant Fredericton bureaucrats on the Council. From then on, he held many of its meetings in Saint John. The legislative session of 1816 was very different from that of 1813, which was the last that Smyth had presided over and which had been taken up mainly with routine measures, except for those designed to promote the conduct of the war. Provincial revenues were buoyant as the economy responded to the increased sale of timber under the protective system introduced in Britain over the previous decade. In 1815 New Brunswick sent to Britain 92,553 loads of fir or pine timber; for Nova Scotia and the Canadas in that year the figures were 19,382 and 11,676. In his speech at the opening of the session, Smyth stressed education, roads, and the need to improve navigation of the principal rivers. There was a great deal of housekeeping legislation, for no session had been held in the previous year and little attention had been paid to domestic affairs during the war years. Important acts were passed dealing with parish schools and grammar schools, including a provision to assess local districts for the support of schools which was removed two years later and not reintroduced for several decades. It is probable that Smyth was interested in this provision and that he was also responsible for a proposal to spend money systematically on the development of the “great roads”; the latter measure was adopted in principle but not implemented effectively. Three months after the session ended Smyth was sent to Nova Scotia to act as administrator. Illness had continued to plague him and by 1816 his wife’s health was also undermined. A year’s absence failed to bring improvement and she died at Halifax on 1 July 1817. Four years earlier Edward Winslow*’s daughter Penelope had described her as “young, handsome, gay,” “a thoughtless flirting little thing that is never at rest without a Beau at her elbow. . . . [She] is pleasant and good natured but has not one speck of dignity in her composition.” Whatever her shortcomings as the chatelaine of Government House, she was dear to Smyth; their shared love of music and their two young children created a bond that had made his exile in New Brunswick tolerable. Her death came shortly before his return to the colony to take up his appointment as lieutenant governor. By then he had become a complete valetudinarian, spending a great deal of time with his personal physician, Dr Alexander Boyle*, and pining for England, for an income that would enable him to retire, or for a promotion that would take him back to Halifax where the climate suited him better. Smyth’s spirits seemed to rise only when he was engaged in musical activities or endeavouring to provide opportunities for education. He gave strong support to the efforts of the National Society for Promoting the Education of the Poor, which was encouraging the establishment in the Maritimes of schools using the monitorial system of teaching (called Madras schools). In England the organization was principally concerned with the poor, but in New Brunswick its schools were attended by students from all levels of society. Smyth encouraged this trend by sending his own son, George Brunswick, to the Central School in Saint John, the first to be established. He often instructed the boys there in singing and presided at the organ when the school was opened. In 1819 he granted a charter to its governor and trustees, giving them authority to establish schools wherever their funds permitted. He was not empowered by his instructions to issue such a charter but the Colonial Office later gave him the necessary powers and authorized the granting of money from crown revenues to the Madras School Board. The charter was approved by the legislature in 1820. Black children were not admitted to the Central School and Smyth, who in both his civil and his military capacities had responsibility for the black refugees settled in the province at the end of the war, was sympathetic to their plight. He himself paid the master’s salary and other expenses of the “African School” in Saint John when he was unable to obtain support in either New Brunswick or England; the school was closed for a time after his death until new funding could be arranged. In Smyth’s time the denominational rivalries that were later to become such an affliction had not yet divided the provincial community. Although the Madras schools came under the supervision of the Society for the Propagation of the Gospel, they did not immediately take on an exclusively Anglican character and in the beginning received strong support from some nonconformists. A spirit of toleration was abroad in 1823 when Smyth and the Council agreed to a bill making provision for a large grant to the College of New Brunswick contingent upon the removal of religious tests for students. Land for the support of the college had been set aside in 1785 and a provincial charter granted in 1800. Teaching at the university level got under way in 1822, the Reverend James Somerville* having been appointed the institution’s president and its only professor two years earlier. Smyth laboured to help clear up a serious problem that had arisen over land titles, in order to prepare the way for an application for a royal charter. He thus played an important role in the process leading up to the opening of King’s College, Fredericton, in 1829, the only state-supported university to be successfully launched in the British empire in that decade. The spirit of compromise did not extend to the marriage law. In 1821 the Council rejected a bill passed by the assembly that would have granted authorization to solemnize marriages to all ministers of the gospel licensed to preach. It was the great increase in income from the timber trade that made possible the advancement of education. The virtually uncontrolled cutting on crown lands had led Hunter to make representations to the British government in 1810, but he had received no response. In 1816 Smyth declared that unless conservation measures were taken quickly the timber in accessible stands would soon be totally destroyed. This time the response was vigorous and decisive. A new era had arrived in which the Colonial Office was determined to intervene in a positive way to give direction to the development of the colonies. Authority over the cutting of timber on the ungranted lands, which still made up nine-tenths of the province, was, in effect, taken away from Sir John Wentworth*, the surveyor general of the king’s woods, in Halifax, and transferred to the lieutenant governor and Council. There then began the struggle over control of the public lands that was to be the central political issue in the province for the next 20 years. Many New Brunswickers regarded the trees on ungranted land as a resource that was freely available to all, like the fish in the streams and the game in the forests. There was, therefore, widespread resentment in 1818 when Smyth and the Council instituted a system of timber licences and a levy of one shilling a ton on all timber taken from the crown lands; they justified the duty by the necessity for a fund from which to pay the costs of surveys. Although the sum demanded was only one-fourth of that exacted in neighbouring Maine, several leading timber merchants in the assembly, Hugh Johnston and Robert Pagan among them, rallied opposition there, arguing that a tax had been imposed without the consent of the lower house and a basic principle of the British constitution thus violated. When the assembly proceeded to challenge the crown’s right to manage the royal domain, a furious Smyth dissolved the house. The policy of creating a timber fund went forward, the large sums that accumulated being expended in the province on the authority of the British government. The effect of the fund was, as its opponents feared, to reduce the power of the assembly while enhancing the role of the governor and Council in provincial affairs. Smyth bore the opprobrium while his successor, Sir Howard Douglas*, enjoyed the advantages of the new system. Smyth had already demonstrated his political ineptitude before he was challenged over the timber fund. In 1818, during the first session of the legislature after he became lieutenant governor, he bickered continually with the assembly and supported the Council, which needed little encouragement, in its rejection of a number of bills. Probably he was trying to reestablish the authority of his office, much attenuated during Carleton’s long absence from the province. He revived memories of the earlier era by questioning the propriety of paying members of the assembly. He returned to this issue again in 1820 and 1822, to the considerable annoyance of Lord Bathurst, who wrote in June 1822: “I can neither approve of your having agitated the question without previously referring for my instructions, or in selecting a subject for discussion in which the Members of the Assembly were personally interested and consequently more likely to consider your recommendation as infringing on their Privileges.” The reprimand was accompanied by an ambiguous set of instructions that would have allowed Smyth to bring the quarrel to an end without losing face, had he shown any inclination to compromise. He chose instead to imply in a message to the assembly that Lord Bathurst would not tolerate pay for members; the quarrel came to an end only when he became too ill to continue it. Smyth belonged to the class of squire-parsons who provided the backbone of early 19th-century English high toryism; his grandfather, his father, a brother, and a nephew were all clergymen. He shared their fondness for horse-racing, and also their sense of the close identification of the state with religion, their dedication to the preservation of a hierarchical order in society, and their devotion to the politics of principle which made them so inflexible in their attitudes towards liberal movements in education and towards democratic political institutions, except when either would promote the interests of the church. He was completely out of place in a North American setting, the idea of politics as the art of the possible being foreign to his way of thinking. In New Brunswick he found few who shared his tastes and point of view, especially since he looked with disfavour on most of the old loyalist families and paid little heed to their claims that past services entitled them to receive special consideration from government. Smyth’s council was dominated by two justices of the Supreme Court, Ward Chipman and John Murray Bliss, who were able, through extensive family connections and links to the Colonial Office, to exert great influence over the direction of affairs. Smyth resented the encouragement that they gave to his opponents in the assembly. In making appointments he passed over their young friends and relatives, the nadir being reached in 1822 when he appointed an inexperienced young lawyer, Edward James Jarvis*, to a vacancy on the Supreme Court. If it was his intention to build up a faction favourable to himself in Saint John, the move was a shrewd one, for Jarvis, the son of a loyalist merchant, had excellent connections there. But the appointment appears to have been mainly designed to spite William Botsford*, the solicitor general and speaker of the assembly. 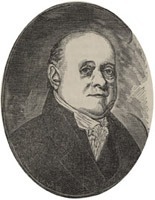 By the end of 1822 Smyth’s standing at the Colonial Office was so low that the secretary of state refused to countenance the breach of the rule that the judgeship should have been offered to the solicitor general; the following spring he named Botsford to the vacancy on the New Brunswick bench and sent Jarvis to serve as king’s assessor in Malta. The Smyth years saw a number of innovations in New Brunswick life, as the community moved from pioneering agriculture into the commercial world of frontier lumbering and shipbuilding. The first steamboat service on the Saint John River was launched in the spring of 1816, with the vessel suitably named the General Smyth, the province’s first steam sawmill was established in 1822, and the Bank of New Brunswick was incorporated in 1820. In 1816, “the year without a summer,” the crops failed. This disaster and the arrival of numbers of immigrants from Britain in the following years drew attention to the condition of agriculture. In 1820 Smyth became president of the New Brunswick Central Society for Promoting the Rural Economy, one of whose objectives was to provide assistance to settlers. Smyth’s sense of his own penuriousness was shown in his selling of his wife’s organ to the church at Fredericton in 1818 for the sum of £170 7s. 1 1/2d., “as it will be the means of continuing the singing, which I have brought to some degree of perfection.” Only in the final months of his life did he throw off the depression that had afflicted him from the time of his illness in 1813. He purchased a more elaborate new organ and presented it to the Fredericton church. He sent to England to have his teen-aged daughter join him, ordered great quantities of classical music, and authorized his agent to recruit two violinists and a cellist to come to Fredericton at his expense. His death at Fredericton on 27 March 1823 came, appropriately, on the final day of another unhappy session of the legislature, which was in fact prorogued because of his illness. Lord Dalhousie, writing in his journal shortly afterwards, noted that Smyth’s death was spoken of publicly in New Brunswick as “a happy event,” and added: “He gave encouragement to nothing but low schools and church Music; he made it his whole study to lay by money, kept no table, no servants, was fretful and ill tempered at all times, & utterly neglected the general machine of government.” Smyth was the only lieutenant governor of the colonial period to die in the province and his funeral was conducted with great ceremony. His death occasioned a conflict over who was to succeed him as administrator, from which Ward Chipman ultimately emerged triumphant. Smyth was a private person and a lover of music who seems to have been more at home with children than with adults. He lacked social grace and had no gift for conciliating divergent interests, though this failing was offset by a genuine Christian charity which he expressed through his concern for the souls and bodies of the poor and for outcasts such as the blacks in New Brunswick society. He was gentle and kind but so broken in health, so depressed by his circumstances, and so little a man of the world as to have been, in political matters, the most ineffective of all New Brunswick’s lieutenant governors of the colonial era. PAC, MG 24, L6; MG 30, D1, 28. PANB, MC 211, MS4/5/2; RG 1, RS336; RG 2, RS7. PRO, CO 188/18–29; CO 189/11–12; CO 324/67; PROB 11/1673/441. Southampton City Record Office (Southampton, Eng. ), Catalogue of Smyth family papers in private possession, comp. P. H. Mather (typescript, 1968; copy in National Reg. of Arch. (London), report no.13153). SRO, GD45/3 (mfm. at PAC). UNBL, MG H8; MG H11. Gubbins, N.B. journals (Temperley). N.B., House of Assembly, Journal, 1817–23; Legislative Council, Journal [1786–1830]. Ramsay, Dalhousie journals (Whitelaw), vol.2. Winslow papers (Raymond). New-Brunswick Royal Gazette, 1817–23. G.B., WO, Army list, 1780–1812. PANB, “A new calendar of the papers of the House of Assembly of New Brunswick,” comp. R. P. Nason et al. (3v., typescript, Fredericton, 1975–77), 1–2. David Duff, Edward of Kent: the life story of Queen Victoria’s father (London, 1938; repr. 1973). F. A. Firth, “King’s College, Fredericton, 1829–1859,” The University of New Brunswick memorial volume . . . , ed. A. G. Bailey (Fredericton, 1950), 22–32. Mollie Gillen, The prince and his lady: the love story of the Duke of Kent and Madame de St Laurent (London, 1970; repr. Halifax, 1985). Hannay, Hist. of N.B. K. F. C. MacNaughton, The development of the theory and practice of education in New Brunswick, 1784–1900: a study in historical background, ed. A. G. Bailey (Fredericton, 1947). MacNutt, New Brunswick. W. A. Spray, The blacks in New Brunswick ([Fredericton], 1972). W. A. Squires, The 104th Regiment of Foot (the New Brunswick Regiment), 1803–1817 (Fredericton, 1962). D. M. Young, “The politics of higher education in the Maritimes in the 1820’s: the New Brunswick experience” (paper delivered at the Atlantic Studies Conference, Halifax, April 1980). D. M. Young, “SMYTH, GEORGE STRACEY,” in Dictionary of Canadian Biography, vol. 6, University of Toronto/Université Laval, 2003–, accessed April 24, 2019, http://www.biographi.ca/en/bio/smyth_george_stracey_6E.html.